S.A.F.E. Structure — a global leader in the design, engineering, and manufacturing of ergonomic safety-first, OSHA-compliant solution driven maintenance stands, fall protection platforms, hangar equipment, portable field equipment, steel structures, and specialty tooling for all aircraft — is set to unveil the first of its kind, jet engine work stand and engine container all-in-one. S.A.F.E. is well known in the aviation industry for its attention to detail in ergonomic designs which ensures that each product they manufacture increases safety and efficiency for mechanics working on and around an aircraft. Recently, when approached to design an engine work stand and engine shipping container all-in-one, SAFE was confident it could design, engineer and manufacture an innovative custom product at a highly competitive price. The newly designed “Engine CAN” will universally fit the M250, PW200, and RR300 engines in an effort to reduce waisted real estate hangar space occupied by multiple single purpose engine stands and engine shipping containers. The Engine CAN will also highly increase the efficiency of both shipping and maintenance work needing to be performed. Currently, engines are shipped in an engine specific shipping container. The engine is then removed and placed onto an engine stand for the technician to work on. Generally, the engine being replaced is taken out of the aircraft and placed on a separate engine stand. This engine stand is positioned next to the newly arrived engine making it easy for the mechanic to interchange parts. Thereafter, the mechanic installs the new engine into the aircraft and the old engine is placed back into the shipping container sealing the lid with a tedious bolt system, and soon after shipped. 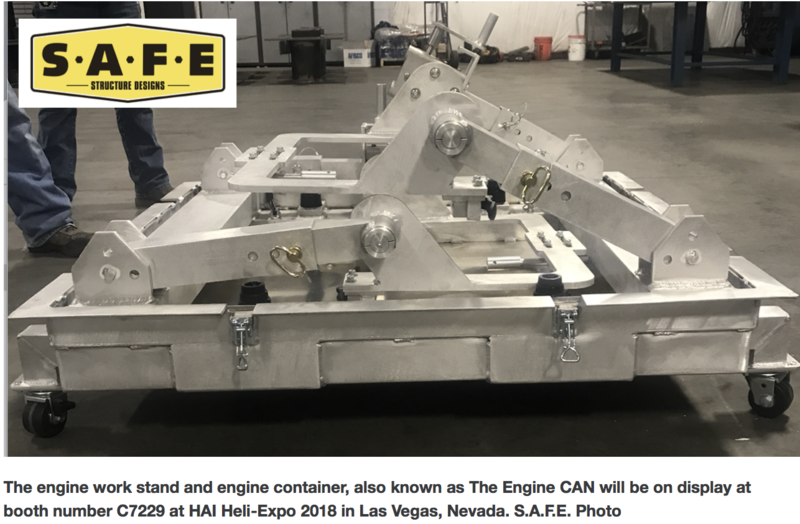 SAFEs’ new design includes all three (3) components in one and is universal between the most common similar size engines being used on the market. With S.A.F.E.s’ engine container and double engine stand all-in-one, the technician will receive an engine in the shipping container, remove the lid, effortlessly, rotate the engine vertically into an engine stand working height position, and mount the second engine into the additional engine stand. Upon completion of maintenance, the mechanic is then able to insert the new engine into the aircraft, rotate the old engine horizontally back down into the container, seal the lid with quick locking latches, and ship it off.